Wow your friends when you share your amazing coloring skills after coloring the gorgeous Mermaid Sabrina on a sandy beach. 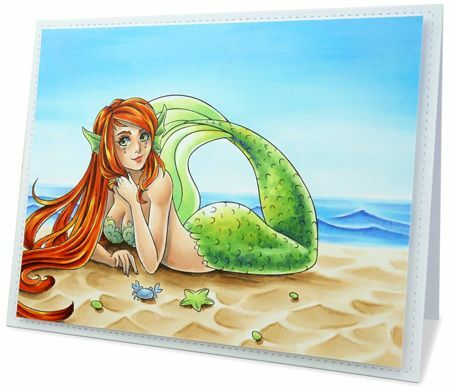 Mermaids are one of my favorite characters to color because you can be so creative with your color choices! You can choose bright colors for her hair and add glitter and sparkles to her scales. Don't feel limited by my choices and have fun! Each class is full of tips and tricks. Not only do I share specific techniques to achieve the main features of the scene but as I color I often break down my thought process and share general tips for coloring that help you in your future projects. Each section focuses on one main element guiding you through each step so you can color along as you watch the video. Please, please print the worksheet before starting. It's easy to sit and watch a video and believe you are absorbing the information but it's 'Active Participation' that truly helps you to learn and retain the finer details. Signing up for this class is more than just taking this class. I'm building a community here and would love you to be involved. If you're having trouble achieiving a particular lesson AND you've held your project at arms length and you're not looking at it with a magnify glass... then please do reach out to me and I will be happy to offer constructive critism to guide you through your learning curve. I want you to promise me one thing when taking my classes. Unfortunately your enrollment into the class is not automatic. I know you can't wait to get started so I will endeavor to add you to the class as soon as possible. Within 24 hours Mon-Fri and possibly a little longer on weekends. All the download files will be automatically accessible via your Make it Crafty account allowing you to get prepared. Please note: If you use a different email address on The Coloring Lab and Make it Crafty websites, please leave a comment when you place your order so that I can find you. 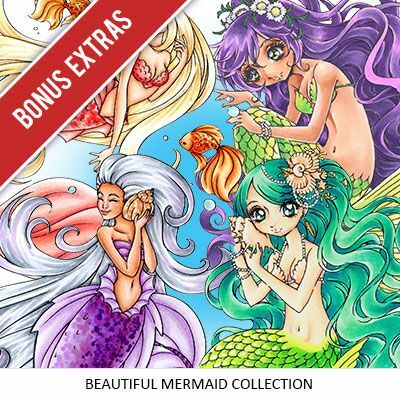 Optionally you can order the Beautiful Mermaid collection and join this class for FREE! The collection includes SEVEN beautiful mermaids plus scene elements and fish. 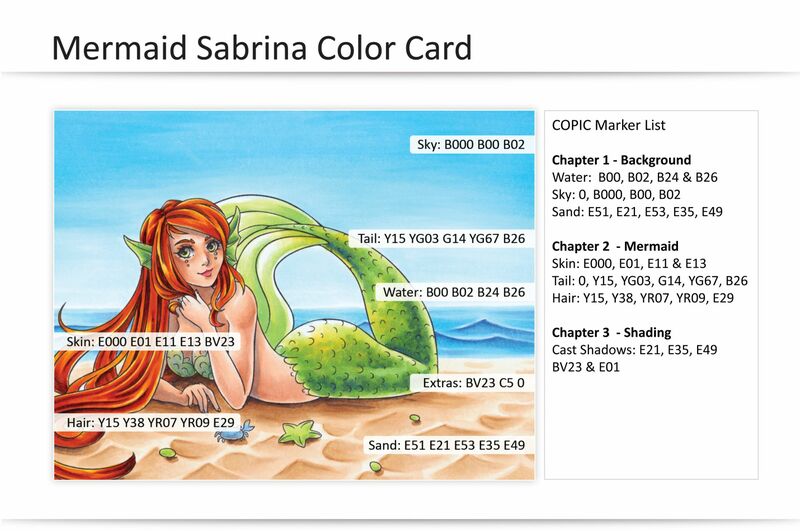 Thank you so much for choosing to take my Mermaid Beach coloring class. The classes have been created on this site to help organize all the videos together and make it easier for you to enjoy each class. You can also join in the community activities and share the projects you are working on in the forums. I would love you to find this community a safe haven, where you can share and receive feedback to help you grow and push your boundaries. I can not wait to see the amazing card you create by the end of this class. Above you will find a list of colors used within the class. You do not need to have all of these colors or the exact same colors. I am a big advocate of making do with what you have. If you are unsure on how to switch the colors with what you already have and would like some assistance, please send me a quick note via the CONTACT ME page, listing the colors you would like to swap and include a list of the colors you have in the same shade. IE: if you do not have the GREEN colors I have listed, send me a list of all the GREEN markers you have in your stash. Have you colored sand before? One of my favorite segments in this tutorial is creating the ripples in the sand. From the start, the shapes play havoc on your mind making you doubt your coloring but as you keep adding the layers of ink you begin to see the ripples form in the sand like magic. Printable worksheet with Fairy Bauble sized and cropped ready for you to print and color. Original Fairy Bauble digital stamp in both JPG and PNG format to use on your future projects. The videos are high quality and narrated so you can watch and listen, pause as you color and then continue watching. Each section has been broken up into segments, so that you can follow along at your own pace. I highly recommend printing the work sheet and having your markers ready before watching the videos, so you can color along with me. This way you are more likely to color the image (teehee) and learn as you try. Watching a video without trying doesn’t always offer the same result as the action of holding the marker and giving it a go.